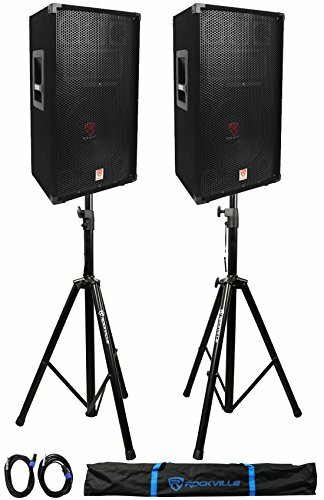 The Rockville RSG-12 speaker system features a high quality 12" low frequency woofer with three electronic, high-efficiency piezo bullet tweeters and one high efficiency piezo compression horn tweeter that provide a true full-range of sound. This speaker produces an incredible amount of power. 1000 Watts peak, 750 Watts Program Power, and 500 Watts RMS Power. Rockville RSG-12 Carpeted Passive Loudspeaker. Single 12" Pro Audio Woofer. (3) Piezo 3" Bullet Tweeters. (1) High Efficiency Piezo Compression Horn. RMS Power: 500 Watts. Program Power: 750 Watts. Peak Power: 1000 Watts. 2" High Temperature Aluminum Voice Coil. 8-Ohm Impedance. Sensitivity: 99dB @ 1w/1m. Frequency Response: 45Hz - 22 kHz. SpeakON Input connection. ¼" In/Out connections (Parallel). Dimensions: (15.4+8.6)x12.5x25.5in. Weight: 28Lbs. Pole Mountable. Adjustable Height. Steel Construction. Black Color. Weight capacity: 100 LBS. Adjustable Height Range: 47.25-78.75 inches. Base spread: 15-40 inches. Tube Diameter: 1.5 - 1.37 inch. Leg Diameter: 1.37 inche. Includes (2) 20 foot 1/4" to Speakon NL-4 speaker cables. Includes (1) Carry Bag.